"Your Dog is in the Bar" book event, Holiday Hours. Florey's invites you meet Pacifica author Celia Day as she discusses her book "Your Dog Is In The Bar"
About the book: Affectionate, warm, and funny, Your Dog Is in the Bar by new author Celia Rensch Day is for folks who want to remember the good old days when neighbors helped mend fences and everyone pitched in when the old store needed a fresh coat of paint and a new roof. This novel-memoir takes a dry-humored, straightforward, journalistic, yet slapstick approach to what life is like, not on the fringe of the big city, but in the thick of it all in a small town. It’s a fresh look at down home, hometown life and the characters that keep it kicking. In Ramona, South Dakota there is seventy-nine-year-old Maude the Mowing Queen and Ira, who is known as Mr. Cat Man, and Russell, the local gravedigger, water meter reader, town maintenance guy, and all around Mr. Fix It. The author has known Ramona her whole life and when she returns with her husband to live there after a thirty-five year hiatus, she learns that the folks she finds there are exactly what she’s been missing. About the Author: Celia Rensch Day is the youngest of nine children. Over the years, she has been an Avon lady, a nurse’s aide, a cook in a state hospital, and a store clerk, not to mention a stint debarking trees to make telephone poles and fence posts. She later became the first woman for Bison State Telephone Co. in South Dakota to do telephone installation and repair. For the past twenty-three years, Celia has also done volunteer sewing for numerous charities. An avid traveler, proud mother and grandmother, she and her husband lived in California for thirty years before returning to her hometown. 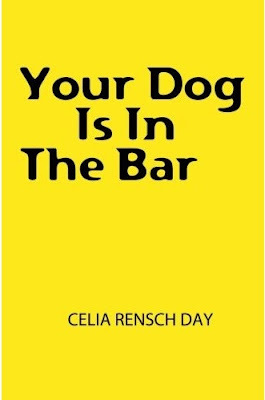 Your Dog Is in the Bar is her first book.